Kingdom Hearts II is ready to tear through the market in both Japan and the United States with the next chapter in the Disney and Square crossover RPG series. If you somehow missed the game that combined Disney characters with Square\'s distinctive RPG style in 2002, Kingdom Hearts follows the adventures of a young boy named Sora. Torn from his home on the Destiny Islands and thrown into a quest to find his missing friends, Sora finds himself assisting characters like Donald and Goofy in a search for their long lost king. The trio visits worlds taken from classic Disney movies like Alice in Wonderland, The Little Mermaid, and Peter Pan, all the while meeting new friends and fighting enemies with the power of the Keyblade. Kingdom Hearts\' first incarnation was on PlayStation 2, then Kingdom Hearts: Chain of Memories was released for the Game Boy Advance and continued the story. Now the action has returned to the PlayStation 2 with an actual home console sequel. Fans of the first will find the second shares some of the same charms as Kingdom Hearts, but with some changes, of course. Many new worlds have been added and include settings from Disney movies like Mulan, Beauty and the Beast, and the Pirates of the Caribbean. Some worlds will also make a comeback, like Hercules\' Coliseum and the Hundred Acre Wood. Of course, along with the new settings come new characters from both the Disney Classics and the Final Fantasy series (Mulan, Jack Sparrow, Scar, Auron, and Yuna just to name a few). There will also be brand new mini-games, as well as new world-related costumes for Sora and his party (for example, in the new Lion King world you\'ll get to control Sora as a lion cub). Players also have an updated battle system and new summon characters to look forward to as well. 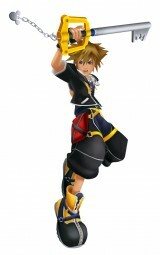 The Kingdom Hearts II website is already up, and will provide enough information and images to wet players\' appetites. There isn\'t much up at the moment, but what is there is pretty impressive. If you haven\'t finished the first two games and don\'t want to be spoiled, you\'ll want to avoid the section of the site that tells the story of what has happened so far. Also worth mentioning is the new Kingdom Hearts manga (Japanese comic) drawn by Shiro Amano, being released by Tokyo Pop in graphic novel format (and a lot cheaper than other manga books currently out right now). The manga seems to be following the plot of the video game. So for those who didn\'t or couldn\'t play the first, they can now get a little bit of a feel for what\'s going on in the KH universe. The first volume is out now, and fans can pick up the second volume early in January an most major bookstores.